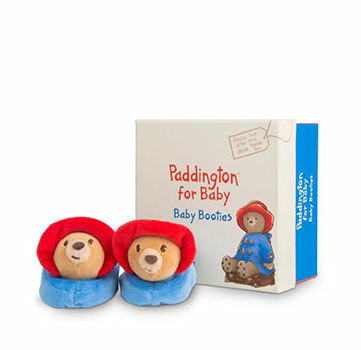 Paddington Bear Boxed Baby Booties Discounts Apply ! These adorable Paddington for Baby booties are made from super soft plush with a cute little Paddington head, featuring a chime rattle on each toe. Watch your baby discover the sounds in their feet and the joy on their faces as they develop their motor skills and learn how to make them rattle. The booties come packages in a beautifully branded gift box making the them a beautiful present for any newborn. .